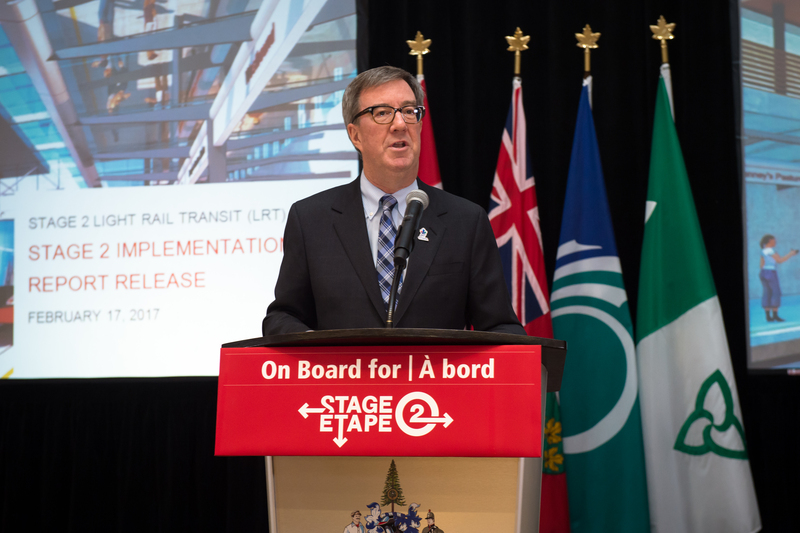 Ottawa – Mayor Jim Watson, Councillor Keith Egli, Chair of the City’s Transportation Committee, Councillor Stephen Blais, Chair of the Transit Commission, and City of Ottawa staff today shared significant news about plans to move forward with the Stage 2 Light Rail Transit Project. City Staff also provided a detailed presentation of a related report on Stage 2 LRT, in advance of the tabling of the report at the Finance and Economic Development Committee on February 24, and at City Council on March 8. The briefing included an update on significant changes to the scope of the project, information on the final alignment adjustments, the recommended procurement model and the specific activities the City will undertake to get ready to implement Stage 2. As part of the Western Line extension, an additional Maintenance and Storage Facility will be built in the Moodie Drive area to continue to fast-track LRT progress westerly and service the 8,500 public servants at the new Department of National Defence employment hub at the former Nortel Networks campus. The briefing also laid out the City’s innovative approach to the procurement of the Stage 2 Project, continuing to work with existing partner Rideau Transit Group (RTG) to ensure an integrated and consistent expanded system while maximizing the amount of work to be procured under new competitions. A new $535-million Design-Build-Finance-Maintain competition for the Trillium Line extension. The $3 billion in light rail contracts will be bundled with additional City infrastructure projects in order to improve construction integration, reduce detours, save money, and reduce impacts to the community. The total of over $3.6 billion in combined work will generate over 21,000 person-years of employment. The Stage 2 Implementation report provides recommendations that meet the directions given by Council in the “Stage 2 Light Rail Transit (LRT) Environmental and Functional Design Report,” approved by City Council on July 8, 2015. If approved, it will allow for a competitive procurement process for all three Stage 2 extensions and the related supporting projects, and permit the projects to be built within the City’s affordability envelope. Once the federal funding commitment is confirmed, the City can proceed with the release of the Stage 2 Request for Proposals. The Moodie extension is expected to be achievable within the original budget envelope for Stage 2.